Home / Editor's Choice, Entertainment News, Featured Articles, Gossip and Drama, News, Videos / Watch Members of Public assist EACC officers arrest a corrupt Kenyan traffic cop, Ni kubaya sasa (VIDEO). 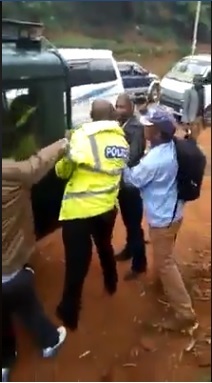 Watch Members of Public assist EACC officers arrest a corrupt Kenyan traffic cop, Ni kubaya sasa (VIDEO). Wednesday, August 15, 2018 - A video of members of the public assisting EACC officers to arrest a corrupt Kenyan traffic cop is going round on social media. The arrest comes days after President Uhuru urged the public to arrest any corrupt Government official. That arrest is for show to the public only. They should ride a long distance matatu say to Nakuru; for every point the police stops them, they have to part with Ksh.50/= and no questions or inspection is done. I am witness because I travel oftenly. when is this Eacc coming to Kangundo road,just go and witness the very many checkpoints and the very open and brazen collection of bribes from matatus and pickups.They dont even both to hide.